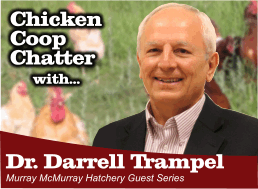 Dr. Darrell Trampel is the Iowa State University poultry extension veterinarian serving the nation's largest egg industry in addition to the turkey, broiler, and game bird industries. He responds to poultry health questions raised by producers and veterinarians, serves as a liaison between the College of Veterinary Medicine and Iowa poultry organizations (Iowa Poultry Association, Iowa Turkey Federation and National Poultry Improvement Plan) and conducts educational programs for poultry producers and members of allied industries. Constituents range from small backyard hobby flock owners to multinational corporations. Dr. Trampel concurrently serves as the poultry diagnostician in the Veterinary Diagnostic Laboratory, conducts applied research on problems of interest to the poultry industry, and serves as a consultant to the State Veterinarian in establishing rules and regulations governing the control and eradication of poultry diseases in Iowa. Professional practice activities include serving as a pathologist for 250-300 poultry diagnostic cases each year that require necropsy and/or microscopic examination of tissues. 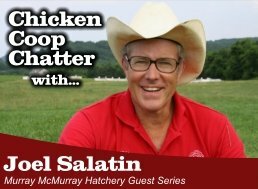 Joel Salatin, 56, is a full-time farmer in Virginia's Shenandoah Valley. A third generation alternative farmer, he returned to the farm full-time in 1982 and continued refining and adding to his parents' ideas.